This script gives some new options to select splines vertices and segments : selection with gaps, random selection and selection by angle. 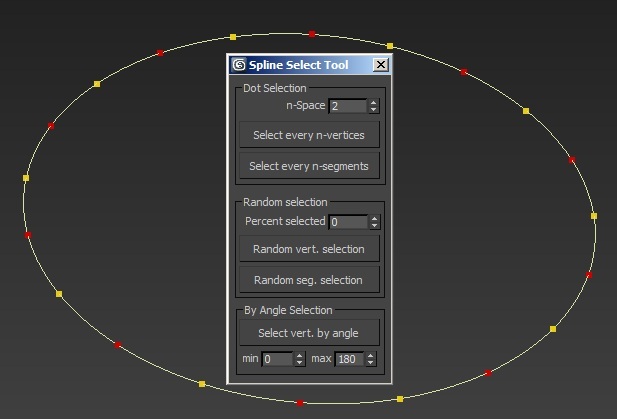 Dot selection allows to select vertices or segments with gaps specified in the n-space spinner. Random selection use a percent value. By angle selection use a min-max value in degree. The selection is only applied on the splines that have at least one vertex or segment selected. Submitted by cgbilal on Mon, 2013-01-07 01:38. Submitted by lunerjelly on Wed, 2013-01-02 22:33. Thank you very much. Good script.